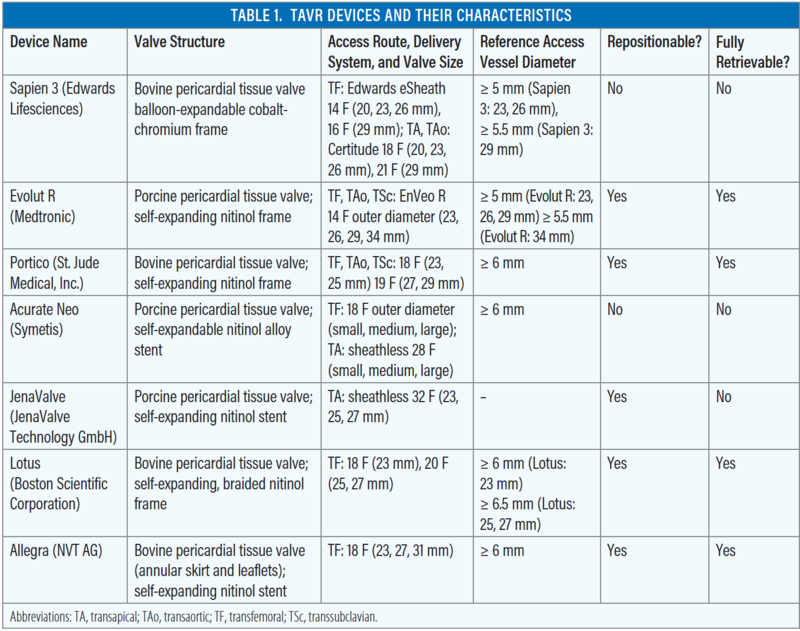 Technical characteristics and evidence to date for FDA- and CE Mark-approved valves. The first prototype transcatheter aortic valve (designed by Cribier and his start-up Percutaneous Valve Technologies) was a stainless steel stent (23 mm in diameter and 17 mm in height) that contained a trileaflet valve (at first made of polyurethane, but soon changed to bovine pericardium). The device was compatible with a 24-F introducer sheath and was initially implanted with an anterograde transseptal approach. After a few years, this prototype evolved into the Cribier-Edwards valve (Edwards Lifesciences), and the original transseptal route was abandoned in favor of the more reproducible transfemoral and transapical approaches.5 At the same time, another device, the self-expandable CoreValve (Medtronic), made of a nitinol frame containing a porcine pericardial valve, had been developed.6 These two devices, which after a few years obtained CE Mark and US Food and Drug Administration (FDA) approval, can be considered the ancestors of all of the commercial devices now available. Figure 1. Overview of the current FDA- and CE Mark-approved TAVR devices. In the last 15 years, TAVR technology has had an impressive advancement, transforming a challenging intervention into a standardized, simple, and streamlined procedure.6 The latest generation of TAVR devices have incorporated features to reduce the delivery catheter profile, facilitate deployment, and enable repositioning and retrieval capability, with the aim of obtaining the desired position and reducing TAVR-related complications.6 According to the type of deployment, current TAVR devices can be divided into the categories of balloon-expandable, self-expanding, and mechanically expandable (Figure 1). The Sapien 3 transcatheter heart valve (THV) (Edwards Lifesciences) is the fourth generation in the balloon-expandable Sapien series of devices.7-15 It is available in four valve sizes (20, 23, 26, and 29 mm). The Sapien 3 valve is designed with a cobalt-chromium frame, three bovine pericardial tissue leaflets, and a polyethylene terephthalate (PET) skirt at its inflow portion and an outer PET sealing skirt to reduce paravalvular leakage (Table 1). As compared with the previous generation of Sapien XT (Edwards Lifesciences), the design of the Sapien 3 frame has been modified to enhance the geometry for an ultra-low delivery profile (14 F) while maintaining the high radial strength for circularity and optimal hemodynamics. The transfemoral Commander delivery system (Edwards Lifesciences) incorporates an inner balloon catheter, on which the prosthesis is crimped, and an outer deflectable flex catheter. The catheter offers dual articulation with partial and distal flew that enables crossing the aortic valve in challenging anatomies and controlled coaxial alignment. The handle incorporates a fine adjustment wheel that allows advancing or retracting the balloon and that carries the valve several millimeters up or down within the annulus without pushing or pulling on the entire delivery system. The Commander delivery system is advanced through a 14-F (20-, 23-, 26-mm valves) and 16-F (29-mm valve) expandable eSheath (Edwards Lifesciences) (minimum diameter, 5.5 mm) (Table 1). The Certitude delivery system (Edwards Lifesciences) is also commercially available for alternative access procedures in patients where transfemoral delivery may not be appropriate. The Certitude delivery system is compatible with an 18-F sheath for 20-, 23-, and 26-mm valves and a 21-F sheath for the 29-mm valve. Due to the presence of the outer skirt, a lesser degree of area oversizing might be acceptable for the Sapien 3 THV than the previously recommended value for the Sapien XT THV (Figure 2). This minimal area oversizing provides the advantage of a lower risk of annulus injury without an increased risk of paravalvular regurgitation (PVR). Figure 2. Sizing chart of the current new-generation TAVR devices. *Cut-off expressed by area, †cut-off expressed by diameter. Otherwise, cut-offs are expressed by perimeter. At this time, the PARTNER II S3 trial is the largest available study reporting on controlled outcomes of the Sapien 3 THV.8 This study looked at data from two nonrandomized studies embedded in the PARTNER II trial on 1,076 intermediate-risk patients and 583 inoperable or high-risk patients who underwent TAVR with the Sapien 3 valve.8 Mortality and stroke at 30 days were low in both study groups (1.6% mortality and 0.8% disabling stroke in the inoperable/high-risk population and 1.1% mortality and 1% disabling stroke in the intermediate-risk population). Figure 3. Major outcomes of the current new-generation TAVR devices. Outcomes are derived from a weighted meta-analysis of 30 studies including 5,923 patients achieved with a comprehensive search of multiple electronic databases from January 2011 to March 2016.8-35 Cumulative rates for each outcome (pooled measures were calculated assuming a DerSimonian and Laird random-effects model weighted by inverse variance incorporating both between and within study variance) and 95% confidence intervals are reported. AR, aortic regurgitation; CI, confidence interval; PPM, permanent pacemaker. The CoreValve Evolut R device (Medtronic) (currently available in four device sizes of 23, 26, 29, and 34 mm, allowing the treatment of native valves with a perimeter of 56.5–94.2 mm) (Figure 2) consists of a tricuspid valve obtained from porcine pericardial tissue, mounted and sutured inside a self-expandable nitinol frame (Table 1).17 The lower part of the device has a high radial force that allows for the self-expansion and exclusion of native calcified valve leaflets. The central portion of the stent supports the valve. As compared with the previous generation of CoreValve devices, the Evolut R provides several refinements to improve anatomical fit, annular sealing, and durability. In particular, the device is designed to enable recapturability and repositionability. The Evolut R frame is tailored to reduce the overall height, while preserving the height of the pericardial skirt (13 mm) with an extended skirt of the inflow tract to provide a seal against PVR. In addition, cell geometry has been redesigned to achieve optimized radial force. The Portico valve (St. Jude Medical, Inc.) is composed of a self-expanding stent, bovine leaflets, and a porcine pericardial sealing cuff. The large cell area and the annular positioning allow easy engagement of the coronary ostia after implantation (Table 1). The large cell area also minimizes the risk of paravalvular leakage by allowing valve tissue to conform around calcific nodules at the annulus. The valve uses Linx anticalcification technology (as used on Trifecta and Epic surgical valves; St Jude Medical, Inc.). The 23- and 25-mm valves are loaded onto an 18-F delivery system, whereas the 27- and 29-mm valves are loaded onto a 19-F delivery system (Figure 2). The Portico valve can be delivered by transfemoral access, and when used with the SoloPath recollapsible introducer (St. Jude Medical, Inc.), has a low 13.5-F insertion profile. Clinical studies have been reported on alternative access sites including transaxillary, transaortic, and subclavian access, and case studies are currently underway to support this issue. The Portico valve is designed to be recaptured and repositioned at the implantation site, until it is fully deployed. The Portico Valve TF EU study studied patients in Europe and Australia. The 30-day results of this large trial (n = 222) demonstrated excellent safety and efficacy of the complete Portico valve family. The valve had exceptional hemodynamic performance (8.3 mm Hg) as well as improvement in New York Heart Association class functional status. There were also lower rates of mortality (3.6%), disabling stroke (3.2%), and 94.7% of patients had less than mild paravalvular leak, and no patients had severe paravalvular leak. The Acurate Neo aortic bioprosthesis (Symetis) is a second-generation valve with flaps composed of porcine pericardium sewn onto a stent made of self-expanding nitinol, covered both externally and internally by a porcine pericardium skirt antileak (Table 1). The device includes three stabilization arches for the axial alignment to aortic annulus, a top crown for capping the aortic annulus, and a bottom that is open to the full distribution on the native valve. The prosthesis can be implanted through both the transapical (28 F) and the transfemoral (18 F) routes using a simple two-step deployment and stable positioning. The Acurate Neo comes in three different sizes: small (21- to 23-mm aortic annulus), medium (23- to 25-mm aortic annulus), and large (25- to 27-mm aortic annulus) (Figure 2). The Lotus valve system (Boston Scientific Corporation) consists of a trileaflet bovine pericardial valve supported on a braided nitinol frame. A central radiopaque marker facilitates positioning of the prosthesis within the aortic root. The frame is covered with an adaptive seal at the inflow segment that adapts to aortic root irregularities and minimizes paravalvular leak (Table 1). This transcatheter heart valve is currently available in three sizes, 23, 25, and 27 mm, covering a range of annulus diameters from 19 to 27 mm (Figure 2). In the fully deployed state, all sizes have a frame height of 19 mm. The 23-mm model can be delivered through an 18-F sheath (small), while the 25- and 27-mm valves require a 20-F sheath (large). The Lotus device is typically inserted via a transfemoral approach, although direct aortic and transaxillary alternative access is possible. This is the only new-generation TAVR device that it is fully recapturable and repositionable even after the valve has been fully deployed. Among the approved TAVR devices, the Lotus valve was associated with the lowest rate of PVR. Mortality, stroke, and vascular complication rates compare favorably with those reported with other new-generation valves.24-29 However, the high rate of conduction disturbances requiring pacemaker implantation with this valve (approximately 30%) remains a concern that should be addressed with the development of the newer-generation Lotus Edge device (Boston Scientific Corporation) (Figure 3). Boston Scientific recently announced a voluntary removal of all Lotus TAVR devices from global commercial and clinical sites. The action is a response to reports of the premature release of a pin connecting the Lotus valve to the delivery system. As with the previously announced suspension of the Lotus Edge valve system device, it is believed that the issue is caused by excess tension in the pin mechanism introduced during the manufacturing process. The company expects to bring the Lotus valve platform back to Europe and other relevant international markets by Q4 of 2017. The JenaValve (JenaValve Technology GmbH) consists of a porcine valve mounted on a low-profile, self-expanding nitinol stent (Table 1).30-35 The valve used in this device is commercially available as either a stentless (Elan valve, Vascutek Ltd.) or stented (Aspire valve, Vascutek Ltd.) surgical bioprosthesis, both of which perform well in long-­term studies. The porcine root leaflets are connected to flexible stent posts to reduce leaflet stress during the diastolic phase. Three different sizes are available (23, 25, and 27 mm) for implantation in aortic annuli that are 21 to 27 mm in diameter (Figure 2). A sheathless 32-F delivery system is used for a three-­step deployment procedure through the transapical route. The unique characteristic of this prosthesis is that the implantation relies on active clip fixation of the native aortic leaflets, thus eliminating the radial forces on cardiac and aortic structures. The unique clip fixation mechanism of the JenaValve to the native aortic valve leaflets could provide secure anchorage even in the absence of calcifications. In fact, the JenaValve is the only TAVR device to have obtained CE Mark approval for noncalcified aortic regurgitation. The JUPITER postmarket registry enrolled a total of 180 patients and showed promising 1-year results. Procedure success was 95%, and all-cause mortality at 30 days was 11.1%. At 1-year follow-up, more than mild paravalvular leak was observed in two patients (3.2%) (Figure 3). The next-generation JenaValve Pericardial TAVR system (JenaValve Technology GmbH) is currently under clinical evaluation with both transapical (22 F) and transfemoral (19 F) delivery systems. It must be noted that the CE Mark for the JenaValve expired in 2016, and the company stopped commercial distribution in June 2016. At the moment, both the pericardial TA and TF system are in the study phase. The Allegra THV (NVT AG) is a self-expandable valve consisting of a nitinol stent frame and bovine pericardium (annular skirt and leaflets). The annular portion of the frame is covered with a sealing skirt, above which the leaflets are sewn (ie, the functional portion of the prosthesis is supra-annular). In addition, six radiopaque gold markers are incorporated to the stent frame indicating the level of the skirt/leaflet transition. The valve is available in three sizes (23, 27, and 31 mm) (Figure 2), with a frame height of 37.3, 41.3, and 43 mm, respectively (Figure 1). The stent frame uses a variable cell size design to allow for axially tailored radial force distribution with higher force in the annular sealing section of the valve for secure anchoring. The upper section of the stent frame has larger cells, which was deliberately engineered to allow for flexure of the stent frame and accommodation of conformational changes during the cardiac cycle, ultimately dissipating leaflet stresses. The transfemoral delivery system incorporates an 18-F cartridge and a 15-F catheter shaft. The grip uses a “squeeze-to-release” mechanism, avoiding any rotation during the entire implantation, which is performed in a stepwise manner. The Allegra device obtained CE Mark approval in April 2017. These next-generation TAVR devices are proving to be considerably safer and more efficient than their ancestors, constituting a large spectrum of valves with different features that allows for almost every different clinical and anatomical scenario and the treatment of an increasing number of patients. 1. Cribier A, Eltchaninoff H, Bash A, et al. Percutaneous transcatheter implantation of an aortic valve prosthesis for calcific aortic stenosis: first human case description. Circulation. 2002;106:3006-3008. 2. Nishimura RA, Otto CM, Bonow RO, et al. 2014 AHA/ACC guideline for the management of patients with valvular heart disease: a report of the American College of Cardiology/American Heart Association Task Force on practice guidelines. Circulation. 2014;129:e521-e643. 3. Leon MB, Smith CR, Mack MJ, et al. Transcatheter or surgical aortic-valve replacement in intermediate-risk patients. N Engl J Med. 2016;374:1609-1620. 4. Thourani VH, Kodali S, Makkar RR, et al. Transcatheter aortic valve replacement versus surgical valve replacement in intermediate-risk patients: a propensity score analysis. Lancet. 2016;387:2218-2225. 5. Cribier AG. The odyssey of TAVR from concept to clinical reality. Tex Heart Inst J. 2014;41:125-130. 6. van Gils L, Tchetche D, Latib A, et al. TAVI with current CE-marked devices: strategies for optimal sizing and valve delivery. EuroIntervention. 2016;12:Y22-Y27. 7. Kodali S, Thourani VH, White J, et al. Early clinical and echocardiographic outcomes after SAPIEN 3 transcatheter aortic valve replacement in inoperable, high-risk and intermediate-risk patients with aortic stenosis. Eur Heart J. 2016;37:2252-2262. 8. Webb J, Gerosa G, Lefèvre T, et al. Multicenter evaluation of a next-generation balloon-expandable transcatheter aortic valve. J Am Coll Cardiol. 2014;64:2235-2243. 9. Binder RK, Rodés-Cabau J, Wood DA, et al. Transcatheter aortic valve replacement with the SAPIEN 3: a new balloon-expandable transcatheter heart valve. JACC Cardiovasc Interv. 2013;6:293-300. 10. Gonska B, Rodewald C, Trepte U, et al. 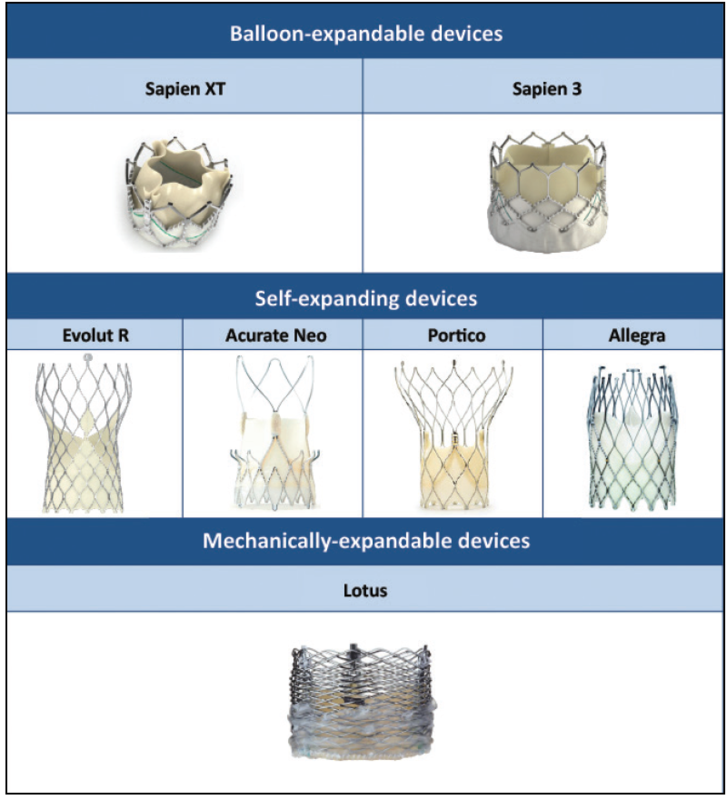 Comparison of the new balloon-expandable Edwards Sapien 3 valve with the self-expanding Medtronic CoreValve for transfemoral aortic valve implantation in 200 patients. Paper presented at: EuroPCR; May 2015; Paris, France. 11. Arai T, Lefevre T, Hovasse T, et al. Comparison of Edwards SAPIEN 3 vs. SAPIEN XT in transfemoral transcatheter aortic valve implantation. Paper presented at: EuroPCR; May 2015; Paris, France. 12. Nijhoff F, Abawi M, Agostoni P, et al. Transcatheter aortic valve implantation with the new balloon-expandable Sapien 3 versus Sapien XT valve system: a propensity score-matched single-center comparison. Circ Cardiovasc Interv. 2015;8:e002408. 13. Husser O, Pellegrini C, Kessler T, et al. Outcomes after transcatheter aortic valve replacement using a novel balloon-expandable transcatheter heart valve: a single-center experience. JACC Cardiovasc Interv. 2015;8:1809-1816. 14. Wöhrle J, Gonska B, Rodewald C, et al. Transfemoral aortic valve implantation with the new Edwards Sapien 3 valve for treatment of severe aortic stenosis-impact of valve size in a single center experience. PLoS One. 2016;11:e0151247. 15. De Torres-Alba F, Kaleschke G, Diller GP, et al. Changes in the pacemaker rate after transition from Edwards SAPIEN XT to SAPIEN 3 transcatheter aortic valve implantation: the critical role of valve implantation height. JACC Cardiovasc Interv. 2016;9:805-813. 16. Barbanti M, Leipsic J, Binder R, et al. Underexpansion and ad hoc post-dilation in selected patients undergoing balloon-expandable transcatheter aortic valve replacement. J Am Coll Cardiol. 2014;63:976-981. 17. Manoharan G, Walton AS, Brecker SJ, et al. Treatment of symptomatic severe aortic stenosis with a novel resheathable supra-annular self-expanding transcatheter aortic valve system. JACC Cardiovasc Interv. 2015;8:1359-1367. 18. Kalra SS, Firoozi S, Yeh J, et al. Initial experience of a second-generation self-expanding transcatheter aortic valve: the UK & Ireland Evolut R Implanters’ registry. JACC Cardiovasc Interv. 2017;10:276-282. 19. Popma JJ, Reardon MJ, Khabbaz K, et al. Early clinical outcomes after transcatheter aortic valve replacement using a novel self-expanding bioprosthesis in patients with severe aortic stenosis who are suboptimal for surgery: results of the Evolut R U.S. study. JACC Cardiovasc Interv. 2017;10:268-275. 20. Kempfert J, Holzhey D, Hofmann S, et al. First registry results from the newly approved ACURATE TA TAVI system. Eur J Cardiothorac Surg. 2015;48:137-141. 21. Erdoes G, Huber C, Basciani R, et al. The self-expanding Symetis Acurate does not increase cerebral microembolic load when compared to the balloon-expandable Edwards Sapien prosthesis: a transcranial doppler study in patients undergoing transapical aortic valve implantation. PLoS One. 2014;9:e108191. 22. Maeda K, Kuratani T, Torikai K, et al. New self-expanding transcatheter aortic valve device for transfemoral implantation - early results of the first-in-Asia implantation of the ACURATE Neo/TF system. Circ J. 2015;79:1037-1043. 23. Moellmann H. Results from the global registry SAVI TF. Paper presented at: EuroPCR; May 30, 2016; Paris, France. 24. Meredith IT, Worthley SG, Whitbourn RJ, et al. Transfemoral aortic valve replacement with the repositionable Lotus Valve System in high surgical risk patients: the REPRISE I study. EuroIntervention. 2014;9:1264-1270. 25. Meredith Am IT, Walters DL, Dumonteil N, et al. Transcatheter aortic valve replacement for severe symptomatic aortic stenosis using a repositionable valve system: 30-day primary endpoint results from the REPRISE II study. J Am Coll Cardiol. 2014;64:1339-1348. 26. Falk V, Modine T, Brecker S, et al. Post-market evaluation of a fully repositionable and retrievable aortic valve in 500 patients treated in routine clinical practice: interim results from the RESPOND study. Paper presented at: PCR London Valves; September 2015; London, United Kingdom. 27. Wöhrle J, Gonska B, Rodewald C, et al. Transfemoral aortic valve implantation with the repositionable Lotus valve compared with the balloon-expandable Edwards Sapien 3 valve. Int J Cardiol. 2015;195:171-175. 28. Dumonteil N, Meredith I, Blackman D, et al. Need for permanent pacemaker following implantation of the repositionable LOTUS valve for the transcatheter aortic valve replacement in 250 patients: results from the REPRISE II trial extended cohort. J Am Coll Cardiol. 2015;65:A1705. 29. Rampat R, Khawaja MZ, Byrne J, et al. Transcatheter aortic valve replacement using the repositionable LOTUS valve: United Kingdom experience. JACC Cardiovasc Interv. 2016;9:367-372. 30. Conradi L, Seiffert M, Schirmer J, et al. Single-center experience using three different second generation devices for transapical transcatheter aortic valve implantation. J Am Coll Cardiol. 2013;62:B238. 31. Nijenhuis VJ, Swaans MJ, Michiels V, et al. First experience with JenaValve: a single-centre cohort. Neth Heart J. 2015;23:35-41. 32. Reuthebuch O, Koechlin L, Kaufmann BA, et al. Transapical transcatheter aortic valve implantation using the JenaValve: a one-year follow-up. Thorac Cardiovasc Surg. 2015;63:493-500. 33. Seiffert M, Bader R, Kappert U, et al. Initial German experience with transapical implantation of a second-generation transcatheter heart valve for the treatment of aortic regurgitation. JACC Cardiovasc Interv. 2014;7:1168-1174. 34. Treede H, Mohr FW, Baldus S, et al. 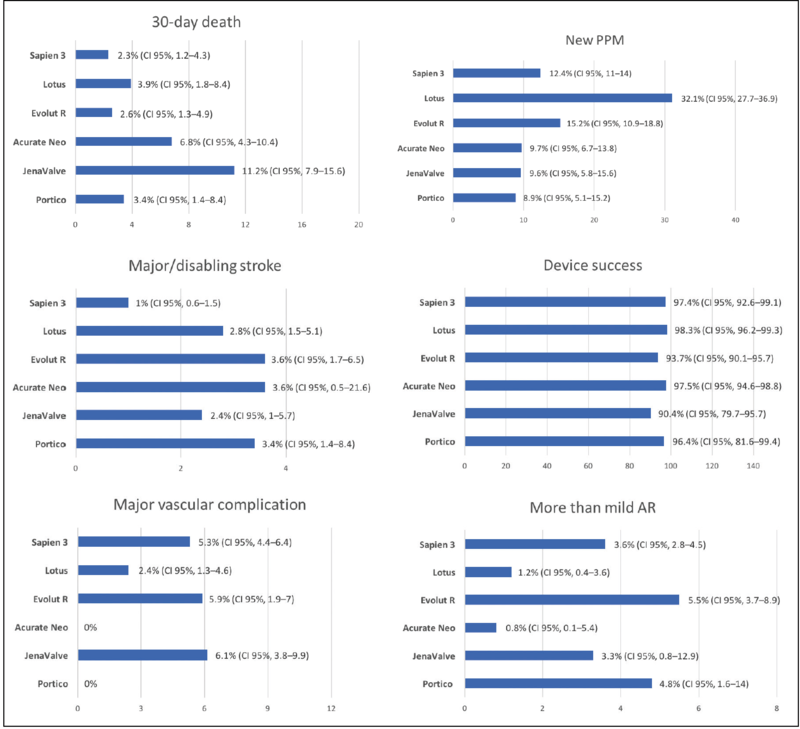 Transapical transcatheter aortic valve implantation using the JenaValve system: acute and 30-day results of the multicentre CE-mark study. Eur J Cardiothorac Surg. 2012;41:e131-e138. 35. Wendler O, Kappert U, Ensminger S, et al. The JUPITER registry: thirty-day primary endpoint results of a second generation transapical TAVI system. Paper presented at: EuroPCR; May 2014; Paris, France. Disclosures: Consultant for Edwards Lifesciences. 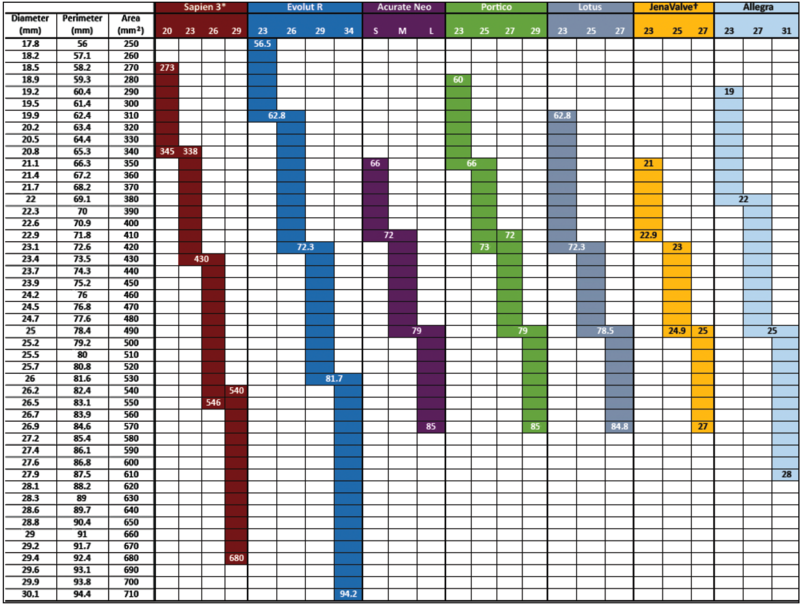 From clinical research to standard-of-care procedural planning. Devices in early clinical development, including devices with early human experience and those originating from China. Can it be done, and is this approach reliable and accurate? What these ongoing data tell us about TAVR and future areas of interest.